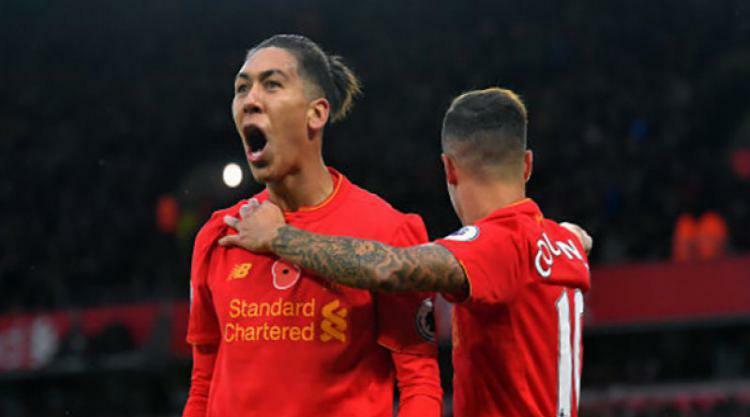 The clash between Liverpool's Roberto Firmino and Everton's Mason Holgate in Friday's FA Cup Merseyside derby will be included in referee Bobby Madley's report after the Toffees raised the incident with match officials. Press Association Sport understands the Goodison club made representations after the final whistle following the 40th-minute altercation in the Reds' 2-1 Cup third round victory at Anfield on Friday. Liverpool have pledged to fully co-operate should any investigation arise following the submission of Madley's report and they be asked for their comments. Madley's comments, plus those of fourth official Jon Moss who was spoken to by the referee immediately after the skirmish, will provide the key focus of the report. Firmino and Holgate were involved in an angry exchange after the Toffees defender pushed the Brazilian into the front row of the Main Stand and words were exchanged which left the young defender incensed. Everton manager Sam Allardyce was asked in his post-match press conference whether the incident was sparked by an alleged racist comment and said: "I'm telling you nothing until whatever systems are used to find out exactly what happened and what didn't happen. "I'm here to talk about football, not about controversial incidents. I only want to talk about football. "Anything else outside of that that happens has to be dealt with by the authorities." Asked whether he has spoken to Holgate, Allardyce added: "I wouldn't tell anybody in this press conference because it is not about that for me. "That is in the other areas of the football club so I've left that with the director of football (Steve Walsh) and said sort that out." Soon after the final whistle Holgate deleted his Twitter account. Liverpool manager Jurgen Klopp refused to be drawn on the issue but the Reds issued a statement after his post-match press conference. "The club and player will fully co-operate with the relevant authorities to ensure the facts are established in a thorough manner if deemed necessary or requested," said a Liverpool spokesman. "While that process is ongoing we will not be making any further comment." Press Association Sport understands Firmino was not asked for his view on the incident immediately after the match but is prepared to give a statement to the FA should a request be made. "I only heard about something but I can't say anything about it because so far I couldn't speak to anybody and I think, from now on, first of all the club will answer," Klopp said. "I don't really know anything about it. "I misjudged the situation obviously completely, because I thought it was about a Holgate foul. "In the end there was no foul, no yellow card, nothing. I didn't get it to be honest - there was a throw-in, was it? "I didn't understand the whole situation after the game. I got information that something obviously happened, but I can't say anything about it." The row overshadowed a dream debut for £75million new signing Virgil van Dijk who scored the winner in front of the Kop on his debut. James Milner's penalty had given the hosts the lead in the first half only to be cancelled out by Gylfi Sigurdsson's counter-attack goal.